For budding costume designer Lola Nolan, the more outrageous, the outfit—more sparkly, more fun, more wild—the better. But even though Lola’s style is outrageous, she’s a devoted daughter and friend with some big plans for the future. And everything is pretty perfect (right down to her hot rocker boyfriend) until the dreaded Bell twins move back into the house next door. When the family returns and Cricket—a gifted inventor and engineer—steps out from his twin sister’s shadow and back into Lola’s life, she must finally reconcile a lifetime of feelings for the boy next door. Gayle Forman's Where She Went was my most anticipated book from the first half of 2011. 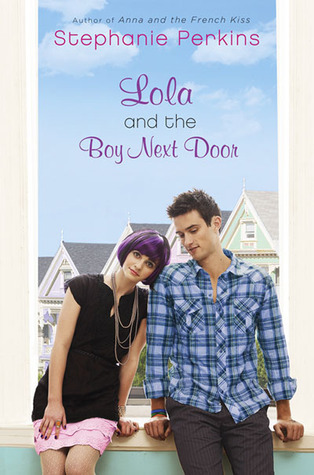 Stephanie Perkins's Lola and the Boy Next Door is my most anticipated book from the last half of 2011. I can't tell you how much I adored Anna and the French Kiss. I mean, who didn't ? Well, I think there were a few curmudgeons out there who had something to complain about it, but most people adored it. And most people agreed that it wasn't just the romantic setting of Paris and the adorable Etienne St. Clair that made the story swoon-worthy. No, from what I've read, most people have reached the consensus that what made the book so perfect was Stephanie's charming, sassy, and even biting style of writing. If I can get my hands on an ARC of this book I will be one happy woman! I vow from this day forward to read everything Ms. Perkins writes! This one is all over today! I loved ANNA AND THE FRENCH KISS. Which also led me to IF I STAY. Before that I wasn't much for contemporary novels. Needless to say I can't wait for LOLA AND THE BOY NEXT DOOR!